The Cisor BT5 is by far the best portable surface speaker on the market and it gives most traditional portable speakers a run for their money. Portable speakers suffer from the ago old problem of size verses sound quality. No one wants to lug around a huge speaker, but at the same time you want a decent power output to satisfy your musical needs. Traditional portable speakers are, on the whole, disappointing, with their small size not conducive to the low bass notes and high volumes which people demand from systems these days. In an attempt to address this, boffins in music sound labs have come up with surface speakers, effectively turning a table, window or any other platform into a speaker, using vibrations to channel the music through the medium. Yorkshire-based Damson's first foray into the surface speaker market comes in the form of the Cisor BT5, a dinky device looking to take on the wallet-friendly Wowee One, along with the huge range of traditional portable speakers. At £99.95 (around $155) the Cisor BT5 is not cheap, clocking in at over double the cost of the Wowee One, however the Cisor has a few more tricks up its sleeves than its lower priced counterpart. 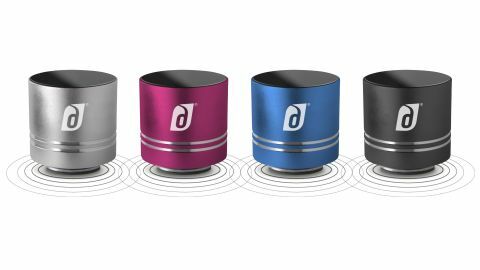 The Damson Cisor BT5 is an attractive piece of engineering, available in four colours (black, blue, pink and silver), the stubby, cylindrical appearance (54mm x 55mm) provides a chic, modern aesthetically pleasing design. Pick the Cisor up and you'll be surprised at its weight, tipping the scales at 322g (that's probably more than your mobile phone, wallet and keys combined) it's far from light – but the solid metal structure oozes premium quality. A rubberised podium protrudes from the base, which delivers the musical vibrations to your surface of choice. However you will have to stick with horizontal mediums, as the Cisor BT5 doesn't have the same magical wall clinging powers as the Wowee One, probably thanks to its weight. If you hunger for vertical playback you can pick up the special suction cup, priced at £9.95 (around $15), which will allow you to stick the Cisor BT5 to windows, mirrors and any other glass surfaces. First off the Cisor BT5 offers up two connection methods, Bluetooth and 3.5mm audio jack capabilities. This makes it perfect for quickly hooking up to a mobile phone, MP3 player, tablet or laptop – with Bluetooth pairing a doddle. The inbuilt battery can be recharged via a USB port, with a multi-function USB cable included in the box, which also has a 3.5mm audio jack connected to it, allowing you to charge and play at the same time. Unfortunately the Cisor BT5 doesn't boast the battery life of the Wowee One, offering up to four hours playback via Bluetooth and nine hours if a wired connection is used. That said, it's unlikely that you'll need the Cisor BT5 to last all day, but the Wowee One's 20 hours of battery life overshadows the Cisor. Obviously the most important part for the Damson Cisor BT5, playback needs to go above and beyond previous surface speakers to justify its heavy price tag. And thankfully, the Cisor BT5 does just that. We weren't sure what to expect when we took it out of its box, but placing it down, pairing it with our phone and blasting out the first tune had us impressed from the word go. The Cisor BT5 uses US Navy patented Incisor Diffusion Technology, which allows the 5W speaker to provide a unique 360-degree sound. Mid-levels were punchy and bright, but where the Cisor really steps up is with the low bass tones, providing a rich and powerful audio experience, even at higher volumes. There can be some slight distortion at the highest volume, but we found the Cisor to be plenty loud enough before we hit the top level. Our inquisitive nature took over about two songs in, which led us running around for about an hour, seeing which surfaces the Cisor would work on. We were delighted to find it works on pretty much anything, including pillows (although playback is muffled) and our shoe rack. We were left cursing that we couldn't stick the Cisor to out walls (or ceilings! ), as it managed to turn the whole surface into a speaker, something we reckon would go down a storm at parties. However we did have the suction cup attachment to hand, allowing us to mount the Cisor BT5 on our windows, and this, without doubt, gave the best playback experience, with the glass proving an excellent conductor for our heavy beats. The Cisor BT5 is also a great alternative to your inbuilt mobile phone or tablet speaker when it comes to watched movies or TV on your device – providing a higher quality of sound than the forever tinny option inside. A word of advice though, make sure the surface you're choosing is clear of any clutter, as the powerful Cisor will make these objects vibrate – giving an annoying sound.